Part of why I consider myself a trendy vintage shop is because I try to keep on top of the trends and buy pieces that can integrate well into the modern, trendy wardrobe. Right now I'm in the process of cultivating my Fall 2013 collection and before I give you a sneak peek of what I'm bringing to the table let's go over the best trends for vintage lovers that will be cropping up this fall. Trends can bring back a real resurgence in classic design elements. One of my favorite trends for the Fall 2013 season is the pastoral trend. Pastoral harkens back to the times of abundant countryside and a simpler and more handmade way of life. I'm a huge fan. 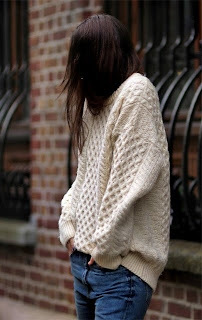 Aran knits are traditional, intricate, and so so beautiful. Versatile and easy to mix into the modern wardrobe. From fitted to slouchy, you can expect to see them this year! This sweater was in one of my favorite Etsy shops, Dear Golden. 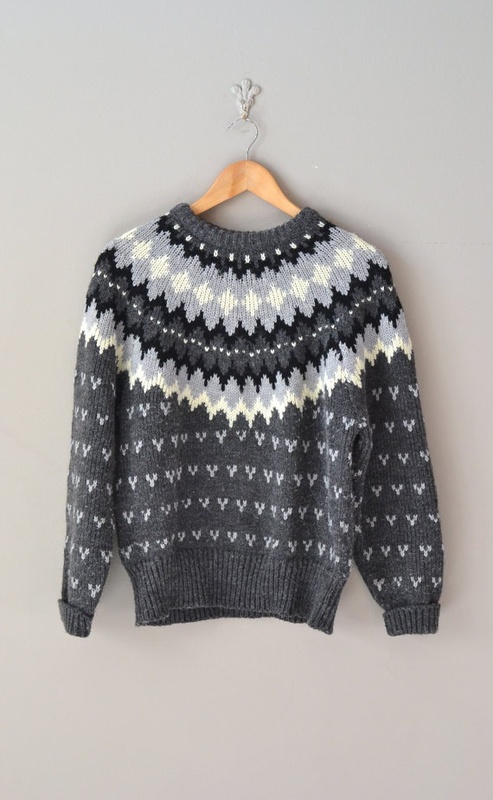 It's long sold now but you can continue to expect lots of fair isle sweaters this year. 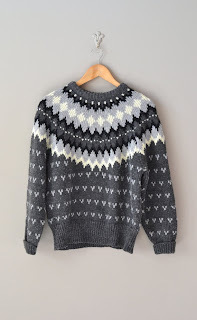 No longer relegated to old men and alpine skiers... quality fair isle knits are truly vintage gems. Not only are knits in, but all shades of green are in for Fall 2013, too! With the color of the year being Emerald (Pantone), it's certainly not a surprise to see variations of this stunning green all over the place for fall. I look great in green so I'm pretty excited about this. I just love this look for fall. 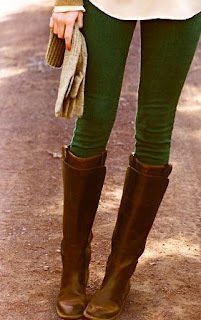 Something about the stark green of the pants mixed with the neutrals is just enchanting. Another great trend for the year is bold repeating prints and traditional plaids. How could you resist? Plaids never truly go out of style, and mixed with flannel material they are a warm, traditional look for fall that is both functional and stylish. 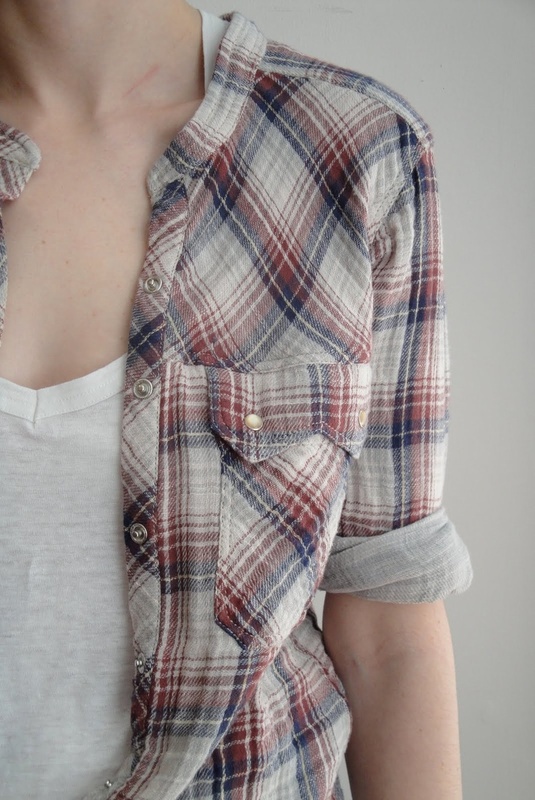 Plaid isn't limited to shirts, either. 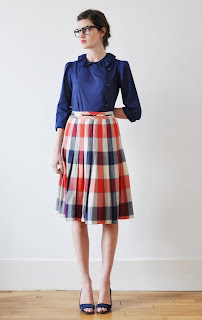 With the right cut and fit, a plaid skirt is lovely and classic (with the perk of usually being warm!). So perfect. 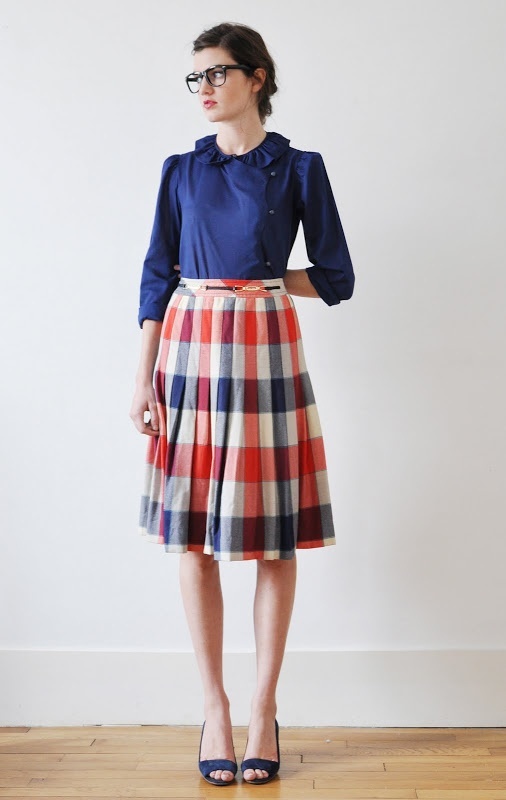 Plaid skirts can transition easily into spring if the colors are right. A good color palette and fit are a must and a plaid skirt can become a necessary staple in your wardrobe in no time. 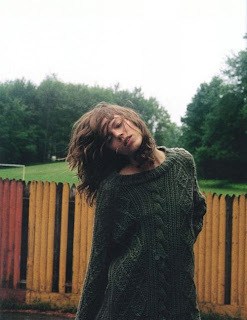 To sum up, the most wearable trends this coming fall for vintage lovers: All shades of green, repeating patterns and plaids, pastoral, and knitwear. Stay tuned to see a sneak peek of what Foxburrow Vintage is preparing for you for Fall 2013! I've thrown in a bit of a surprise to keep things exciting and am bringing my own sense of style to the already established trends. For more great styling ideas, check out my personal style board on Pinterest.